I've been spinning. A lot. Almost every day (except the weekend, which got busy with other life type things). My goal for the Tour de Fleece is to spin enough laceweight Merino Tencel to be able to make something reasonably substantial out of it. Possibly a Clapotis (because apparently, I didn't get it out of my system the first six I made). Other than that, I've been spinning on a new spindle and I took a bit of a non-laceweight break on Friday night to spin some Yarn Yard Shetland into DK/Aran weight singles, because my hands were cramping up with the fine stuff and I just needed a break. 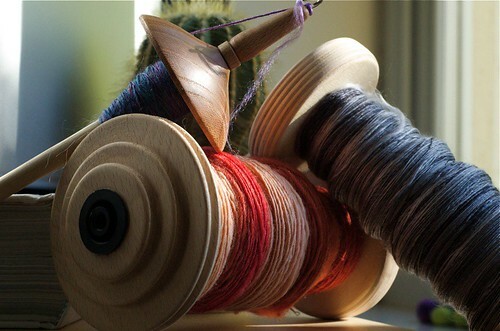 I'm going to try and get as much spinning in as I can today and tomorrow, because in the wee hours of Wednesday morning my wee sister arrives along with her husband and my 22 month old niece, and I suspect that spinning might well be off the menu once they arrive. I haven't seen them in more than six months, and my niece is, by all accounts, very much her mother's daughter, so will, I imagine, be into everything.